Learning the Parenting by Connection approach has been the greatest gift to Lyra’s parenting. She has seen the transformative effects of the Listening Tools within her own family, and with those to whom she has taught the approach. Lyra feels that having this knowledge empowers parents with valuable skills and information from which to draw from when challenging situations arise. She believes the support offered by her session is what sets it apart from the many other parenting approaches out there. 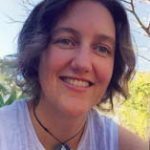 In 2007, Lyra completed a PhD in Public Health and now puts her research and teaching skills into practice with her current work as a certified Parenting by Connection Instructor. She is dedicated to learning each day from her two children, fellow parents, and through a keen interest in reading and keeping up to date with the latest research. Lyra lives north-west of Brisbane, Australia, with her husband and two children. She teaches Parenting by Connection through local talks, online and in person classes and support groups.